Irvine is an enormous expanse of ground, more than 400 km2, located south of the coast of Los Angeles, that forms the heart of Orange County and would emerge around the campus of the same name. Its urban planning is an essential element of the history of recent territorial planning in the United States. This urban conglomerate occur from the gradual transformation of a former cattle ranch. The first urban ideas are born in the mid-twentieth century the choice of where to site a new university and have a first expression in the formalization of a campus centric radius around a large open space, Aldrich called Park. 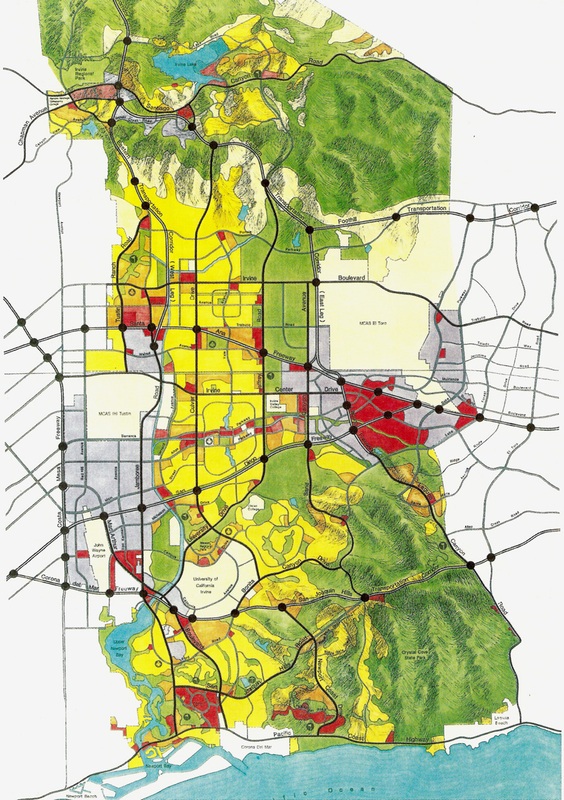 In the fifty years to the original Irvine University have been adding new pieces to form a conglomerate urbanization urban, inhabited by more than two hundred thousand people and containing numerous services, economic activities and, even an international airport, el John Wayne Airport. This has been a gradual process of territorial planning, led by the Irvine Company has scheduled so indelibly the typical Californian contemporary territory arrange private transport around the car. Aerial perspective of the coastal Orange County, including numerous low-density residential developments, mixed-use area and mall Fashion Island and Newport Beach in the background.